When I heard that Donald Trump was going to be president, I was upset. Extremely upset. I didn’t want to have to see what an actual Trump presidency would bring about. The idea put a large pit of fear in my gut to think that someone with such crude language and hateful feelings towards multiple different groups of people could be in a position of such power, and furthermore that so many people were in support of this. With all of the threats and promises for “change” that he’d made during his campaign, there was no telling what he’d actually go through with when he was elected into office and what was just talk. One of the most shocking of his plans is the ban that he wants to enforce. While I guess we won’t ever really know what his intention with the ban actually was, a lot of people believe that it’s actually supposed to be a Muslim ban and not just an immigration ban to keep terrorists out of the country. But regardless of what his true intentions were, it’s a pathetic plan that has an insurmountable amount of flaws to it. Immigrants have just as much of a right to be in this country as any of us do. Who is he to judge who gets to enter the country and who doesn’t? “Americans stand up and fight for faith, family, and freedom. Syrians run away.” A quote that I recently stumbled upon, which automatically made me sick to my stomach. Yes, Syrians and other immigrants may be running away from their countries. They are trying to escape something that they don’t want to be a part of. But that doesn’t make it a bad thing, and it doesn’t make it something that should be looked down upon. They are running away because they have to, and because it’s what’s best for their families. How could someone condone something as heroic as that? How could you find something wrong with trying to find safety and salvation? But just like that, Syrians were compared to Americans, one being bad and one being good. Sadly, this is how a lot of Americans think. And now that Trump is president, they aren’t afraid to publically spew bigotry because that is what their leader does best. I do not think that Americans are bad in any way. I’ve been living in America for the majority of my life, and just recently became an American citizen myself. I am American, even though I wasn’t born here. I was born in Sweden and lived there for a couple of years before my parents decided to immigrate to the United States in search of what most other immigrants are searching for, “the American Dream.” My dad was born in Egypt and my mom in Sweden, and our family has just as much a right to be here as do the other immigrants that are looking to start a life here. No, immigrants from Egypt weren’t banned because as a country we have “business ties” with them, and obviously people aren’t concerned about terrorists coming from Sweden. My family is going to be fine. But this issue really speaks to me on a deeper level, because my family alone represents the melting pot that America has always claimed to be and bragged about being. I stand with the people who are being affected, because they don’t have their own voices right now. Trump’s executive order on the ban literally was said to be an “extreme vetting” of immigrants. It was meant to indefinitely suspend the entrance of Syrian refugees and other immigrants across country lines. The order reads “I hereby proclaim that the entry of nationals of Syria as refugees is detrimental to the interests of the United States and thus suspends any such entry.” Detrimental. To the interests of the United States. Just astonishing. I’m a Muslim with white skin and blonde hair, I don’t wear hijab, and I’ve been a resident of this country for most of my life. I don’t fit the “typical” idea of which most people think of when they hear the word “Muslim”. Does that make me any less Muslim? No, it doesn’t. Islam is a school of thought, a religion. That’s it — nothing more, nothing less. You can’t look at someone and know if they’re Muslim or not. It’s a way of life, a way of thinking. And in no way does being a Muslim equate you to being a terrorist. Anyone who kills other people and claims to be a Muslim is anything but, because Islam preaches peace and love and is against any form of violence. Stating that you’re going to implement a plan to block out “minority religions” in predominantly Islamic countries is honestly just utterly ridiculous and completely sneaky in my opinion. Implying that you’re going to make it more difficult for people who ascribe to an entire religion – and potentially block them from entering the country altogether? I mean come on, it’s unspeakable. If someone had told me that the U.S. was going to attempt to do that just two years ago, I would’ve laughed in their face. I could go on and on about this subject, but I’m tired. I’m tired of having to defend the defenseless. I’m tired of having to defend myself and who I identify as. I’m just tired of everything, and wish with all my heart that the current state of the country wasn’t what it is today. Because it shouldn’t ever have to be like this. I shouldn’t be feeling ashamed to be a new citizen of this great nation, and I shouldn’t be feeling like we took 2 steps back as a country. But we can’t grow tired now, not when others need us the most. We have to speak up for the people who currently don’t have a voice. 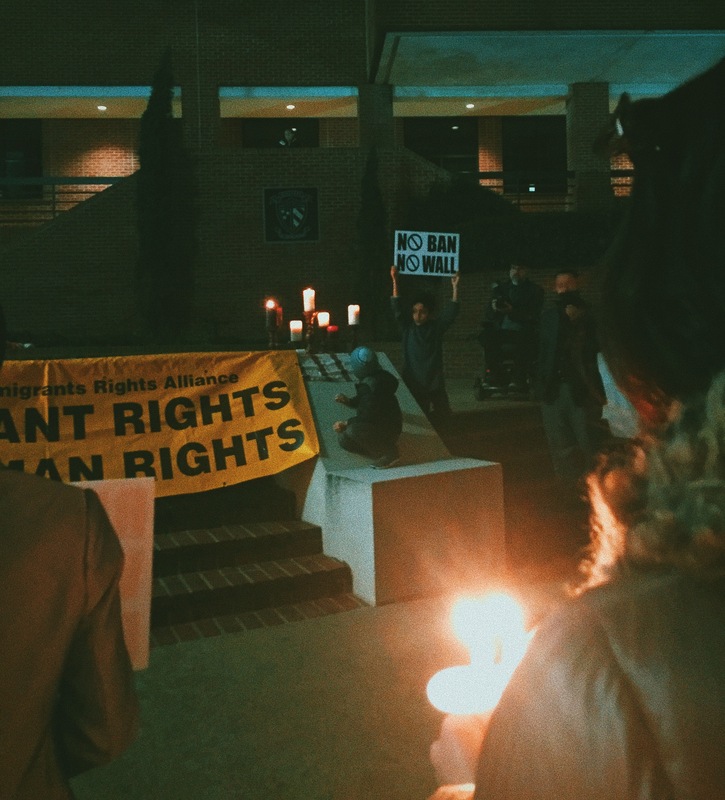 And after attending the candlelight vigil here at Millsaps last week and seeing the outpouring of support that people have been giving at the nation-wide protests and various events that have been held, I am confident that the we the people — or the majority of us anyway — of this great country of ours won’t let this ban become a permanent thing. I’m confident that we will all continue to come together to fight for what’s right and what’s righteous and against what we believe is wrong.